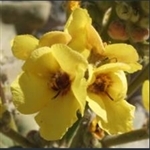 Striking, tall mullein with wonderful felted silver leaves and yellow flowers. Stems of opposite pairs of leaves, topped with blue flowers. 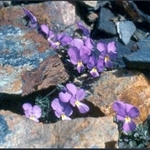 Vigorous violet with lots of deep blue-purple flowers with yellow markings. Vigorous violet with lots of blue-purple flowers. Vigorous viola with small purple-blue and white flowers. Deep purple edges with a large cream centre with yellow eye; fragrant.